Steve Lockhart has worked as an SLM practitioner (a form of acupressure and deep-tissue massage) since 1988, specialising in the treatment of chronic pain and injury, including sciatica. His new patients are usually referred by other satisfied patients and this has sustained his busy practice for over two decades. He has worked closely with many elite and A-list athletes treating Iron Men and Women; World Silver Medallist rowers; UK Premier League soccer stars; World Class Triathletes; Commonwealth Games Gold Medallists and World Champion boxers. Confronting some of the most complex injury problems presented by athletes and other everyday people has given Steve an excellent understanding of the body and how it responds to a variety of conditions and lifestyles. Steve's success is undoubtedly as a result of his understanding of the body at a physical level and his ability to come up with the best treatment for any given pain. His treatments usually provide faster, more effective and lasting results than can be achieved with other forms of therapy. 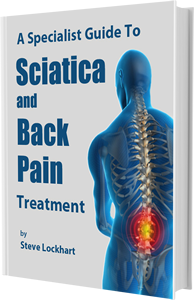 Steve has obtained an Associate Diploma in Health Science and is an accomplished author, having written 'THE BAD BACK BOOK' and the 'DO IT YOURSELF GUIDE FOR SCIATICA & BACK PAIN SUFFERERS'. Both books were written to empower pain sufferers to manage and treat their own pain and assist with their rehabilitation. As word of his successful techniques spread in the early 90's, Steve focused on developing an SLM bodywork programme, founded in 1993, and has since trained therapists all over the world in its theory, techniques and application. Steve has gained an unparalleled reputation for treating pain and chronic fatigue syndrome and was labelled the "Mr Fix-it man" by a Sun Herald newspaper article in July 2000. In 2002 The Daily Telegraph described his treatments as 'healing methods which provide the answer to stubborn problems of the chronically distressed'.